You are here: Home > History > E Company, 22nd Inf. Regt., Nov. 16 - Dec. 3, 1944. Lt. William C. Mason, 3d Platoon Leader and E.O., Co. E.
S/Sgt. David F. O'Malley, Supply Sgt. On the morning of the 16th we left the assembly area to move up to the to the LD. After the attack had begun we moved around the left hand side of a large clearing which was in the middle of our zone of action. Our route of advance ran thru a small draw and, shortly after starting our attack, we received a very heavy concentration of mortar fire. As soon as we had drawn up alongside of G Co., which was on our right, we ran into an extensive obstacle consisting of barbed wire about 25 yards deep and approximately 1' high. Thin wire ran around a number of pillboxes which were placed in a pine thicket. Lt. Mitman, 2nd Platoon Leader, (who had received a battlefield promotion about one month before) was leading with his platoon and personally went forward to reconnoitre the enemy defence area. He was shot thru the head. Harry Coles a medic attempting to go to his assistance was shot down by a burp gun. At this moment G Co. called over the radio for E Co. to move up so Captain Newcomb decided to bypass this area. This was after we had received a considerable concentration of small arms fire. E Co. swung to the right and followed the same course along which G Co. had advanced. When it reached a small clearing just west of the main north-south road (at #3 on map), E Co. found G and both dug in facing the clearing. F Co. meantime had been left back about 800 yards to the rear to protect the supply line. The supply line however was continuously cut by sniper fire upon those trying to move up to the front line companies. That night heavy mortars fired on our front lines and on the supply route. We had not gotten our communications to battalion so Capt. Newcomb sent out a patrol back to battalion. The patrol leader returned with orders from Lt. Col. Walker, Bn. Commander, to clean out the island of resistance which E Co. had bypassed. About 2 rifle squads, the remnants of a platoon of A Co., which had been sent down from the 1st Bn. to make contact with the 2nd Bn., had joined E Co. during the night. This platoon wanted to get back to 1st Bn. Captain Newcomb ordered Lt. Mason to take a reinforced squad from his platoon and the two A Co. squads and clean out the draw as the Bn. commander had ordered. The platoon from Co. A would then go on and rejoin the 1st Bn. Mason was to continue on to 2nd Bn. Hq. and pick up rations. Mason, taking one of his rifle squads reinforced by the BAR team from another squad and the 2 squads from Co. A, left the Co. CP and headed back toward the draw. As he approached the eastern end of the draw he heard a burp gun firing at someone trying to come up the supply line. Approaching as near as possible to the fortified area he stretched out his men in a skirmish line and led an assault on the first pillboxes. One Jerry jumped up out of the first pillbox and Mason's first scout killed him. One by one all of the strongpoints were cleaned out by firing the BAR's into them and hurling a couple of grenades in. The three squads advanced abreast. One large pillbox which must have been a CP was in the middle of the area. One of our men hurled a grenade inside and heard some moaning. He hollered for the Heinies to come out. Nothing happened. He threw another grenade in. There were even more groans in reply. Another call failed to bring any of the Heinies out. He repeated this operation 4 times. The fourth time he hurled an HC smoke grenade. Finally 4 Krauts crawled out. One was a medic. These were the only 4 that we captured alive. There was perhaps a total of 15 or 16 Krauts in all of the 12 to 14 pillboxes. Further to the west Lt. Mason could see that there were 3 or 4 other bunkers. He went over to F Co's area and found Lt. Clark, C.O. F Co., and asked him to clean out the other boxes as he was anxious to pick up his rations and get back to E Co. before dark. Lt. Clark agreed and Mason was soon back at E Co. with the supplies. At 0800 E Co. attacked to take the high ground to the east (026380). G Co. went straight ahead across a little clearing. E Co. however skirted to the left and went thru some heavy pines on the northern side of the clearing. G received heavy mortar fire. E suffered only one casualty killed, and only 1 or 2 wounded as it advanced thru the very dense woods. Captain Newcomb halted the advance just west of the north-south road and ordered the company to dig in in positions from which it could overlook this road. The captain went up to the edge of the hill overlooking the road and saw a Jerry walking along. The Jerry must have been wounded and was heading back toward his aid station. The captain let him go because he didn't want to give away the companies position. The Bn. commander then called for Capt. Newcomb to come back to battalion and assume command of it. Between 2130 and 3000 o'clock he returned and said that the company had to continue its attack across the road. Lt. Robert Pisarek led his platoon across the road and waded the stream on the other side, continued on up the next hill thru some scrub pine to the day’s objective. Not one round of hostile fire did we receive during that advance. We advanced right up to the objective and dug in. Lt. Mason was told to take his platoon up to the left and contact the 1st Bn. so as to tie in with them. This ho did and the 2 battalions then presented a straight front. E Co. had 3 platoons in line. Lt. Mason placed his platoon CP in a Jerry bunker which had been an ammunition dump. The Co. CP too was placed in a bunker which must have been some sort of CP as it had sons well constructed straw filled bunks in it. The weapons platoon was carrying only one light machine gun and one mortar. Due to the shortage of personnel the others had been sent back to battalion. Lt. Mason and the 1st and 2nd Platoon sergeants were called back to the Co. CP and told to prepare to receive replacements. The company got only about 10 replacements, 2 of whom went to the 3rd platoon. The company commander also said that 2 TDs and 2 tanks were being sent up and that Lt. Mason should point out positions where they should go in his platoon area. When they arrived Mason pointed the positions out to them and then was caught in a heavy mortar barrage. That night Captain Newcomb called the platoon leaders and said that the company was going to attack the next day according to plans which he had told them before. The company remained in the same position. The company received a number of replacements. That night Captain Newcomb received an order to report to battalion. He did so and returned and issued orders to his platoon leaders. 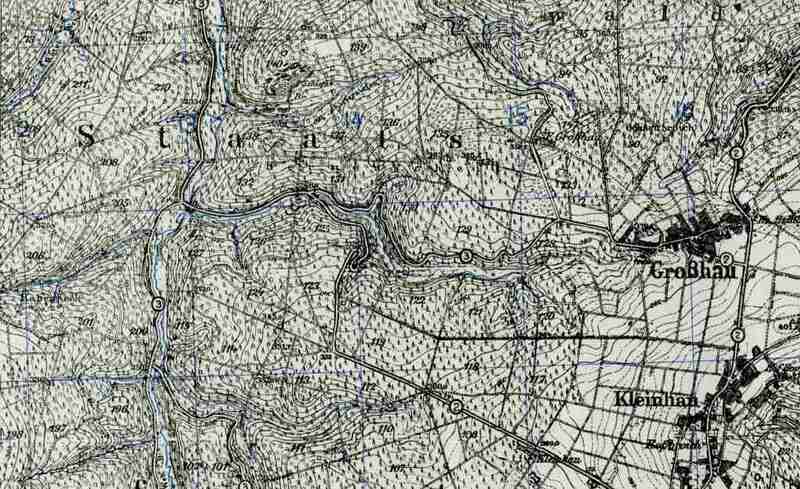 The objective for the next day's attack was the edge of the woods west of Kleinhau with E Co. attacking with its right on "Easy Street". At 0800 the attack began. E Co. ran into 2 or 3 Jerry dugouts and captured 8 prisoners. However the resistance was very light. From the sound of the firing it appeared that F Co. was catching most of the enemy fire. E did receive some sporadic arty fire but suffered no casualties. The company dug in on the edge of the woods. About twilight a Jerry patrol came up from the direction of Kleinhau towards our front lines. The new men hadn't gotten "zeroed in" so they fired upon the Germans who immediately hit and shot up an amber flare. Seconds passed before a tremendous volley of mortar and arty shells showered down on the area. The Co. CP was right in the midst of this barrage. Weapons Platoon had 5 men wounded and Co. Hq. 3 or 4. Lt. Mason had been sent out to find the arty forward observer. When the barrage started he hopped into a foxhole. One of the men came running straight for the same foxhole screaming, "I'm hit, I'm hit." Examination showed that his leg had been almost cut off. Pvt. Huffziger, the medic, heroically tended the wounded during the arty barrage. Bn. Commander called Captain Newcomb back to become Bn. E.O. and Captain Faulkner assumed command of the company. During the 2 days that the company remained at the edge of the woods it received 2 groups of replacements totalling 117 men. Before one of these groups could finish getting dug in, an arty concentration killed 2 and wounded 2. When Captain Faulkner went up to assist B Co., Lt. Mason kept the weapons platoon, Co. Hq., and replacements (who had come up later) back with him for the defense of the old line. At noon Lt. Mason received orders from the Bn. Commander to take the remainder of the company up to join Captain Faulkner. He called Captain Faulkner on the 300 radio and said, "I'm bringing up a lot of minnow bait" Be ready for them." He asked for Captain Newcomb to send a guide to meet him so that the replacements could be guided to their respective platoons without any delay. Although the Krauts had been shelling the area, where Captain Faulkner had the 3 rifle platoons, very heavily, E Co. managed to get their replacements dug in during a lull without a single casualty. Received orders from Bn. Hq. that the companies should make up a list of all shortages of equipment. This signified a short stay in that particular locality. When the list had been finished it was sent back. Bn. Commander called at about 1130 and ordered Captain Faulkner to attack Grosshau at 1200. Captain Faulkner said he couldn't get ready in a half hour. The Bn. Commander then said, "you'll have to jump off by 1245." E Co. attacked at 1245 with the 3rd and 1st platoons leading. 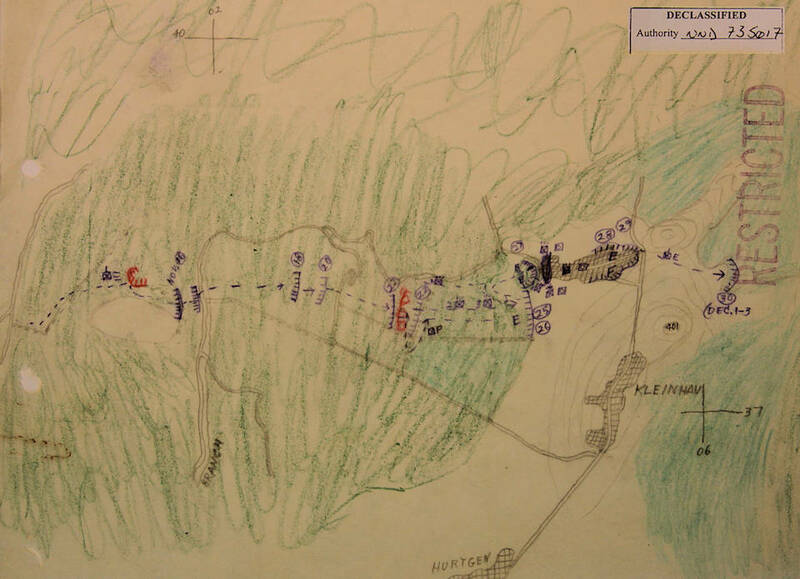 The 3rd platoon formed a base of fire with the 1st attacking down the draw to the southeast of the town. To assist this attack we had 2 TDs and one tank. After the first 15 or 20 minutes we had one TD left so the attack was virtually stopped. The 2 infantry platoons had been pinned down by a lot of machine gun and direct artillery fire. Captain Faulkner called battalion and asked what had happened to the "big boys" (tanks) which were supposed to attack from the woods southwest of Grosshau. He was told that they would be there soon, and they were. With the assistance of the tanks, Grosshau was cleaned out by shooting up each house individually with tank fire and then letting the infantry clean it out. The fight lasted into the night and we were lighted on our way by the moon and flames of the burning buildings. F Co. came up when the fight was over and helped set up defenses. At 1400 E Co. was ordered to move up into the woods east of Grosshau and help set up defensive positions with G and F Companies. Captain Faulkner had to practically take over F Company's area as there were only 12 man left in F Co. For the remainder of the campaign E Co. remained in the same position. The Jerries had the commanding ground in this area and therefore had observation on our positions and he shelled the hell out of us. On the night before the relief Captain Faulkner sent Lt. Lloyd back to battalion. He returned 5 or 6 hours later and made this statement: "The position which we now occupy must be hold at all costs." He also said that we were going to be relieved. We were relieved by the 83d Div., a platoon at a time. This relief was well carried out. Map showing the advance of Company E, 22nd Infantry. Comments by S/Sgt. David F. O'Malley, Supply Sergeant of E. Co.
On Nov. 19th Sgt. O'Malley was following the white tape which had been stretched up to the front line companies to set as a guide for supply parties. When he came to a break in the line he turned to the right instead of to the left as he should have done. Passing down a steep hill he came to the road at (019376). He was leading 10 replacements who were carrying water and rations for E Co. Looking across the road he saw one Heinie coming toward him and about 30 seconds later another Heinie arose from the small stream just on the other side of the road. This second Heinie had just filled a bucket of water. The Sgt. didn't know how many more Heinies were around and decided that he had definitely gone in the wrong direction so he told the men to start slipping off to the rear by one's and two's. They slipped off so well that he lost 2 of them and couldn't find them until much later. In supplying the battalion during the days from Nov. 17 thru Dec. 26 6 "doodlebugs", which had been borrowed from 1st Army Ordnance, were used. These jeeps proved invaluable in this role. Not only did they assist tremendously in carrying supplies but they also helped to evacuate the wounded. Four litter cases could be carried at a time on each "doodlebug". Two could be strapped on top and two placed inside. If the casualties were not too seriously wounded a larger number could be carried in the jeep. After the first ten days all 6 of these Jeeps were out of working order having irreparably thrown their tracks or having been knocked out by enemy fire. For a ten day period however they performed invaluable service. M29 Weasel (a.k.a. 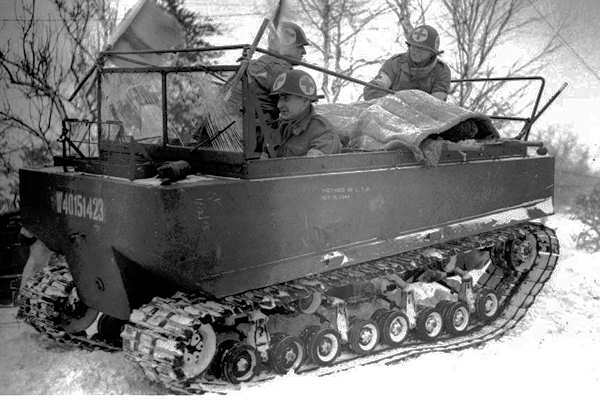 Doodlebug) tracked vehicle built by Studebaker.